Completely Barking Mad: Like, the Sweetest Ever! I can't help marveling over these crazy Sweet 16 birthday parties they keep showing on TV. These kids get lavish parties and luxury cars as gifts. Which you'd think would make them happy. But no sooner are the keys deposited into their grasping little hands then there is crying and histrionics. Because, you see, Connor just showed up with Meredith, when everyone knows that his destiny was to kiss the birthday girl at midnight beneath a fake sky of streamers and Christmas lights. Like, duh!! I mean, its her party and she'll rage at Daddy over this injustice, and the fact he didn't spring for Valet parking, if she damn well wants to! And all this brings to mind my 16th birthday. The only thing memorable about it was the fact that my father grudgingly decided he would stop answering the door with a shotgun when I had a date. Not much to celebrate, unless you wanted to date me. But it has got me thinking. If my parents were fabulously wealthy, slightly senile, and not a little bit tipsy by 10 am what would I ask for? 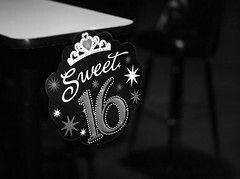 Well, I think you will all agree a party, especially a Sweet 16 birthday party is about the theme. Picking the perfect theme ensures a great party. So knowing this, and knowing that my fantasy Sweet 16 has an unlimited budget anything is possible. So I have to ask you dear readers, which would be the perfect theme? Posted by Heidi Schempp Fournier at 10:55 a.m.